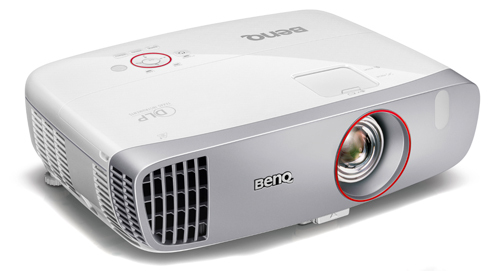 The BenQ HT2150ST Gaming Projector is as perfect a projector for serious gaming as we have yet seen. It combines a rapid 16 ms input lag with low fan noise, ample light output, fully saturated and balanced color, a short throw lens, and some very decent onboard audio in the event you don't have an external audio system handy. It is full native 1080p resolution and can be had for just $999. If you want the optional wireless module it is an extra $299. In addition to very short lag time, another key to this projector's success is the RGBRGB color wheel which ends up delivering outstanding color brightness measuring up to 100% of white in Game mode, which is in all respects well calibrated for gaming use. The ST in the name indicates short throw, and for gaming applications this is ideal for a lot of users. The HT2150ST puts up a 100" diagonal image from about 5.5 feet, give or take a half a foot, so it is well suited to coffee table or portable stand use with the gamers located behind it. Upon start up the projector defaults to Game mode. The picture in this mode is clean, clear and sharp. It is slightly cool in color temperature but not dramatically so. Contrast and black levels are reasonably good -- quite sufficient for ambient light use and typical for gaming applications. In lower ambient light or for viewing in a dark room, if you want to give the Game picture a bit more snap you can bump the default 2.0 gamma setting up to 2.2 and switch the color temp from Cool to Normal. With these simple adjustments you are good to go with an exceptionally well calibrated picture for either gaming or movies that needs no further tweaking. Cinema mode automatically defaults to 2.2 gamma and Normal color balance, rendering an impressively natural picture right out of the box. Choosing Cinema automatically sets the lamp to Eco mode, so it reduces brightness by 32%. If you want that dimmer picture you're all set, but switching the lamp to Normal brightens it up without any boost in fan noise. The input lag in Cinema mode is 49.7 ms compared to 16.4 ms in Game mode. You can see the difference in lip synch when watching a movie. By selecting Game mode and switching gamma to 2.2 and color from Cool to Normal, you retain the short lag time of Game mode while getting the more accurate color and better saturation of Cinema mode. Two of the operating modes have less appeal. Game Bright gives you slightly more brightness than Game but it drops gamma to 1.6, compromising black levels and color saturation. Some people might find a use for this, but we can't. Bright mode maximizes the total potential light output of the projector, but at the expense of a severe color shift toward green. The picture is harsh and unattractive. We'd avoid both of these modes. The HT2150ST gets an "A" for image sharpness from top to bottom and side to side. One of the benefits of single-chip DLP design is that it eliminates any possibility of misalignment that can sometimes happen on any three-chip design. When three independent imaging devices are not properly converged it can compromise color and sharpness. The Sharpness control runs on a scale from 0 to 15. We found the ideal setting for the smoothest image to be about 5. The Cinema mode defaults to 7 and the rest of the modes default to 15. Setting this control is a matter of personal taste, and the ideal setting will vary based on whether you are viewing game or movie material. The only noteworthy flaw in the picture is that brightness uniformity is below average. On our sample the picture shows reduced luminance toward the left third of the screen. However, while this is obvious on a 100 IRE white test image, the viewer is not likely to be aware of it when gaming or watching movies. The high ANSI contrast and solid color saturation on this projector tend to mask this particular flaw. Can you please investigate BenQ vs other DLP projectors brightness uniformity issues? I recently bought HT1075 to try and was BLOWN away how much sharper and crisper the imaged is compared to Epson 3LCD. However, it stays in my living room and often it is used for browsing etc. so I quickly noticed the brightness issue (left side if it's on table, right side if it's ceiling mounted). I got 2 more to try (total of 3 HT1075) and they were all the same. Now, if you are watching dark movies, sure not noticeable. But we use it for TV as well and it bothers me as heck. Also, on Life of Pi, there were many scenes I was clearly seeing that. So is it a limitation of DLP or is it just BenQ? I am in love with DLP, even though I see RBE but this brightness issue is a deal breaker for me. Can this handle NVIDIA 3D Vision running 1920x1080 at 120 Hz (i.e. 60 Hz for each eye)? Cheers for the review. Just wondering if the fan noise the same as the HT2050 unit? All things being equal, too much audible fan noise is a deal breaker for me. Would love if you could set up a numerical measurement system. Like the way they measure pc fan noise. Setting up a db meter the same distance away every time so the reader can get a clearer idea of what to expect. Hi Guys I just bought one over xmas. The fan noise is really low. I don't even notice it. For Gaming its flawless. For watching tv and netrflix on ym ps4 its perfect. The image quality is amazing and to be very honest with you guys..... you would be silly to ever buy a TV again. Is it worth to upgrade from Optoma GT1080 (2015 Model; not Darby or E model)? My friend might buy it second hand from me, but want something better to upgrade to. I mainly game and watch movies and need a short throw. Absolutely worth the upgrade. Unfortunately the Gt1080 uses an rgbcwy color wheel, which results in sub par color reproduction, more rainbows, and lower contrast. The Ht2150st does use a longer throw distance however. Anyone know how this compares to an Optoma GT1080Darbee? I hear rumor (can't confirm) that the Darbee version of the Optoma1080 uses an RGBRGB color wheel vs. the RGBCY(whatever) wheel of the original GT1080, resulting in better color output. Wondering it this levels the playing field more vs. the HT2150ST. Yeah I've compared this baby head-to-head with the Optoma GT1080Darbee and the difference is night and day. The BenQ HT2150ST has much for well-saturated colors and general color brightness. ALSO, total perceived lumens output is actually HIGHER for the BenQ despite their claimed numbers. For instance, with the 1080Darbee, if I wanted to bump up the contrast to get more light output, I lose all color accuracy - not so with the BenQ. But then again, perhaps these two units aren't a fair comprison, because the GT1080Darbee is going for $599 right now and the BenQ is $899 - that's a whopping $300 dollar difference - a big gap especially in this price segment. All in all, this BenQ is leagues ahead of the Optoma GT1080Darbee, if we don't take price into consideration. Hello, I have two Leo Bodnar testers. One is 720p and the other is 1080p. I own this BenQ HT2150st projector and a rear projection screen setup. I do not use keystone or any image flipping. I know what I'm doing. At 1080p, this projector does have one frame of latency. I get 16.9ms with my tester. At 720p, lag shoots up to 34.9ms! The low lag only works at 1080p! Camera tests at 480p also show two frames of lag. 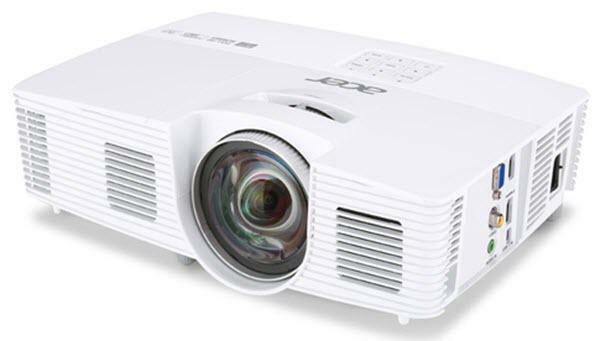 This projector is only low lag with a 1080p input. Frankly, I'm deeply disappointed that reviewers couldn't be bothered to spend a few extra bucks and check 720p and 1080p at the same time. This should have been published. It's only one frame of lag at 1080p. Try the 720p Leo Bodnar yourself and see. It's not keystone or any image flipping. It's not my install. It's the projector. Just received the projector today and have it ceiling mounted. I need to adjust my screen, but wow! This this looks amazing! I was never able to see RBE on my buddy's DLP rear projection tv, but do see it with this projector, mainly in the set up menu and only when I purposely look for it. Movies look amazing as does TV. I'm still a n00b with the whole calibration thing, and for me, Gaming looks just fine for now. I do see the brightness uniformity issue, but it's unnoticeable.